Belfast Health and Social Care Trust (BHSCT) and Yarra Software have recently signed a revenue sharing agreement in relation to a new clinical software tool, E-CAT (Electronic Caseload Analysis and Activity Tool). Other parties to the agreement include the University of Ulster and Community Practitioners and Health Visitors Association (CPHVA). The E-CAT product is a clinical tool developed by real-life district nursing professionals to meet the growing challenge of satisfying increasing demand with fewer resources. E-CAT provides nurses at all levels in the community with a statistical tool to measure clinical need and nursing performance, thereby allowing them to analyse need in relation to the skill and distribution of the workforce. 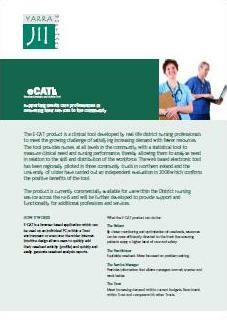 The web based electronic tool has been regionally piloted in three community trusts in Northern Ireland and the University of Ulster carried out an independent evaluation in 2008 which confirmed the positive benefits of the tool. The product is currently commercially available for use within the District Nursing service across the NHS and will be further developed to provide support and functionality for additional professions and services. For more information relating to E-CAT click on the image to download the flyer. The E-CAT clinical software tool is a result of five years collaboration between BHSCT, Yarra Software, University of Ulster and CPHVA. For more information relating to E-CAT, please contact Mrs Gabby Tinsely, Services Manager, Social and Primary Care Service Group (Older People Services), BHSCT – e-mail: Gabby.Tinsley@belfasttrust.hscni.net.